John Duckworth’s exploration of Eastern contemplative ideas, iconography, and practices of self-inquiry has influenced the evolution of his artistic practice into a new multidisciplinary body of work. This exploration culminated in an ambitious exhibition entitled "AWAKE", which was installed at the City Gallery at Waterfront Park in Charleston SC from November 7 - December 21, 2014. The exhibition was an immersive multi-media experience, guiding each visitor through eight sequential rooms while wearing wireless headsets playing original ambient audio compositions in four distinct audio zones. This website offers a room-by-room look at the entire exhibition, including all 90 original works of art - spanning painting, photography, film and sound. 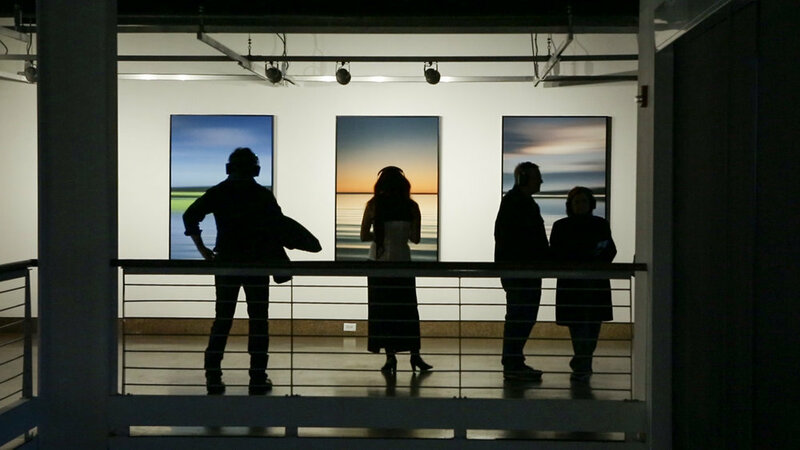 With over 90 original works of art (paintings, drawings, video and audio), the exhibition is a complete multi-media experience. Upon entering the gallery each visitor is handed a set of wireless headsets, along with a guidebook describing the flow of the space. There are four different audio zones within the space, encompassing eight distinct rooms in sequence. The exhibition begins with a 12-minute video/performance in a small black room wherein Duckworth meditates for the duration, as the video is projected on top of him and around him. The combination of audio, video and performance is intense, and is intended to immerse the viewer into a present-mind headspace, and create room to be more receptive for the work that follows. CLICK THE IMAGE OF EACH ROOM TO SEE THE ARTWORK AND EXHIBITIONS STILLS FROM THAT ROOM. The Laboratory contains seven paintings, and three large framed works on paper. This work expands upon John’s exploration of a cross-cultural dialogue between Eastern contemplative practices and Western contemporary culture, while experimenting with varied techniques of screen-printing and painting. It is in this series where Duckworth’s work shifts both visually and conceptually. Continuing his practice of ‘curious anticipation,’ he has embraced the unknown, allowing the work to illustrate his inner explorations. These works at once investigate themes of media excess, artificiality and biology, life and death, and the disorderly and orderly. Many of the multi-layered paintings visually shift and reveal alternate content depending on proximity to the work. The exhibition is bookended by a second video installation, offered as a moment of contemplation of the exhibition experience. 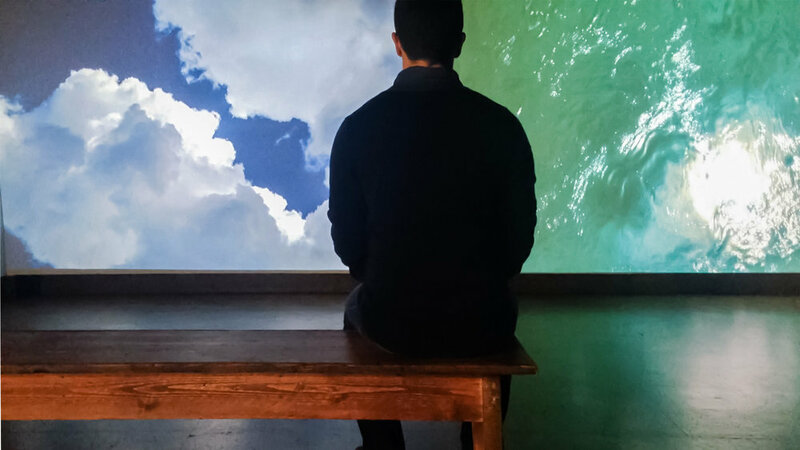 This room contains two 15-minute videos projected side by side, one is clouds, and the other of water. Viewers are instructed to put headsets back on and switch to Zone 4, an original musical score by composer Lee Barbour. The videos, entitled "Be Like Water", are inspired by a translation of a Tao Te Ching concept "water is fluid, soft and yielding. but water will wear away rock which is rigid and cannot yield." Duckworth is drawn to this idea of embodying easefulness and grace, while still containing immense power and strength. This room offers the opportunity to sit and observe, to embrace the ‘witness’ within us and practice watching our thoughts pass as momentary as clouds in the sky or ripples in the water. This Awake hardback book catalogs John Duckworth's pieces and artist statements from his Awake Exhibition. This Exhibit has traveled alongside Duckworth to Charleston, SC, Asheville, NC, New York, NY, Johnson City, TN, and London, UK. John Duckworth’s exploration of Eastern contemplative ideas, iconography, and practices of self-inquiry has influenced the evolution of his artistic practice into a new multidisciplinary body of work. With over 90 original works of art (paintings, drawings, video and audio), the exhibition is a complete multi-media experience. Upon entering the gallery each visitor is handed a set of wireless headsets, along with a guidebook describing the flow of the space. There are four different audio zones within the space, encompassing eight distinct rooms in sequence. To view the full Awake Hardback go here. Please check the box before continuing. I give permission to run my credit card for the purchase of an original John Duckworth Awake hardback book. Thank your appreciation in John's work! Your Awake Exhibition Inquiry has been submitted. John will get back to you as soon as he returns to the studio.